“If you want to get to know the land, go and sleep with it.” Ray Strong knew the land. He was a landscape painter, muralist and poet from the time he was just eight years old. In the early 1930s Strong returned to San Francisco, where he helped organize the Art Students League of San Francisco. There he studied and taught with Maynard Dixon, Frank Van Sloun and George Post and eventually opened an Artist’s Cooperative Gallery. During the Depression, Strong painted murals for the WPA. Some of his 1930s paintings are now in the Smithsonian American Art Museum. 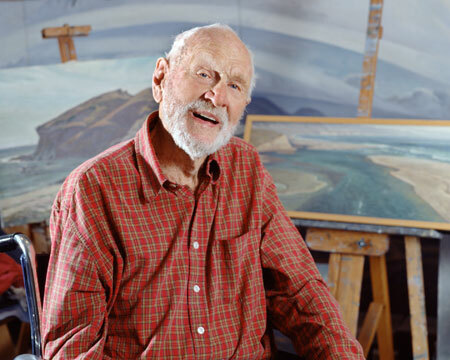 In 1960 Strong and his wife Elizabeth moved to Santa Barbara, California, for “the birds and the banks.” Strong had been commissioned to paint the backgrounds to dioramas in the Bird Hall of the Santa Barbara Museum of Natural History, as well as paintings for a local bank. Ray Strong lived and worked in Santa Barbara County, and is now recognized as the inspiring eldest member of the Oak Group. Ray Strong’s documentation took place in 2004. The FOTM Archive contains extensive information about this artist.